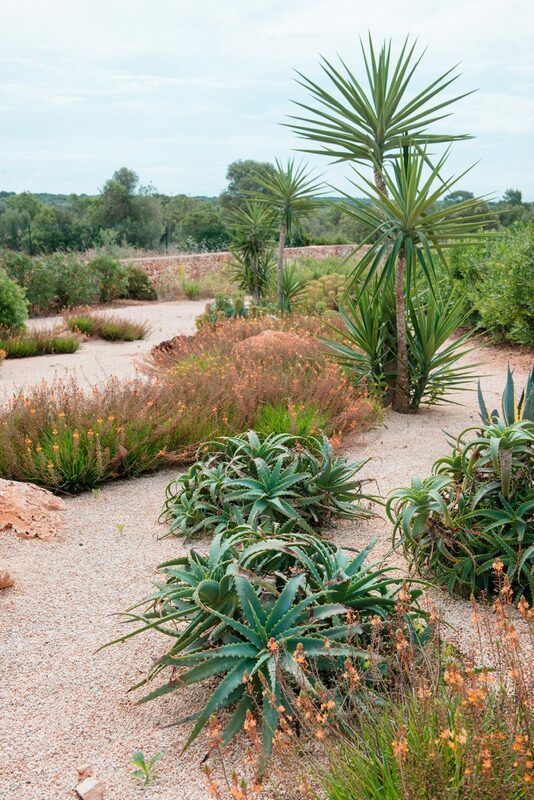 We met three garden designers on the island who have distinct approaches to the Mallorcan botanical landscape. Coincidentally, each comes from a part of the world where rain is plentiful and the seasons are four, and – like some of the species in their gardens – they have had to adapt to the island. From precise geometric formality to wild flower fields, their styles are as wonderfully varied as the diverse terrain of the island. And each designer has developed a distinctive Mediterranean garden that focuses on sustainability without sacrificing style. When Englishman Alexander Warren-Gash and American Jennifer Warren-Gash met in Costa Rica 12 years ago, they never imagined they would become a cutting-edge landscape design duo in Mallorca. Ten years ago the young couple moved to the island to “upgrade flip flops for sandals…we were ready for a little more culture,” Jennifer laughs. 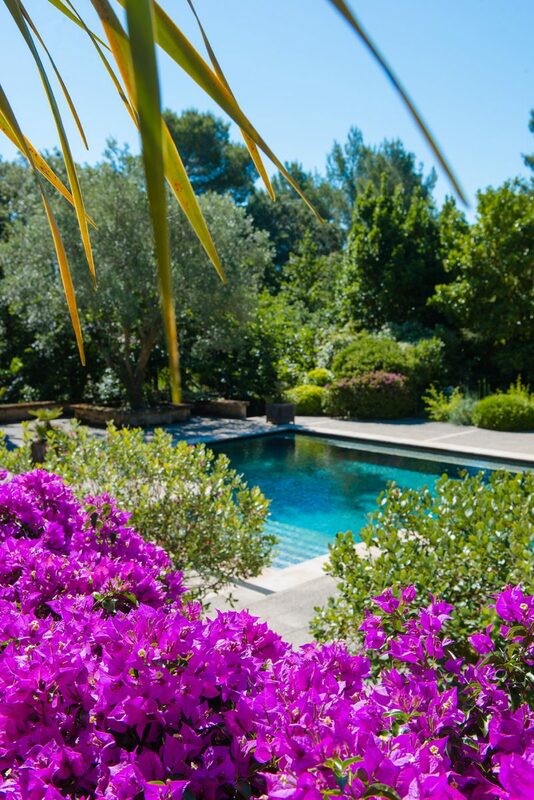 Alexander had an interest in garden design and began working in gardens when they arrived on Mallorca to learn about plants and the Mediterranean climate. Today the couple work as a team, creating modern conceptual “aromatic meadows” that flow in “rhythms” of wild grasses, rows of pale pink Gaura, scented violet Lavender Dentata, bushes of silver green Teucrium, and blue spires of Echium. Hearty banks of Seville roses are a favourite for long-lasting blooms and vibrant hues. The focus for Mashamba Garden Design is on the blooming from season to season, balancing the plants’ shape and colour changes throughout the year. 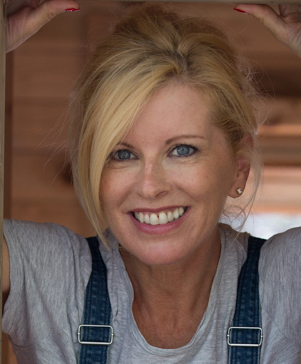 Jennifer is the brains behind the terraces, designing special vessels for pool areas and furnishing outdoor living spaces. “We want to create secret places, places to retreat to and read or nap,” she explains. In designing dry gardens, Mashamba’s emphasis is on low water consumption and sustainability. “We prefer not to make sprawling green lawns,” Alex says, “they are expensive to maintain here and suffer disease.” Instead, they opt for local porous marès stone gravel paths and sub-tropical species of plants; Agave, Yucca, Aeonium and Aloe are planted with bulbous Teucrium and Buxus bushes to create structured, geometric dry gardens. Behind the beautiful raised flowerbeds, lush leafy walls and creative landscapes of Contemporanium is English designer Mark Whiting. He moved from London to Mallorca after studying at the Inchbald School of Design. While a botanist at heart, Whiting has a strong architectural style and focuses on creating gardens that are low maintenance and low water consumption. He is an expert in the hard details of gardening such as grounding paths, drainage systems, and wall construction. In designing a garden, Whiting believes the planning of the architectural landscape is as important, if not more so, than the plants. And lighting is integral; he uses low LED lighting to illuminate pathways through the garden for night wandering. For a British client, a gentleman farmer who loved the painter Mondrian, Whiting used the artist’s minimalist ‘jazz’ paintings as inspiration for a newly built 20,000-square-metre estate. The Modern Farm has rows of grape vines crossed by bands of olive trees, and a grid of citrus trees surrounded by fields of wheat. The garden surrounding the house is linear and precise, planted to echo the dimensions of the building with long raised rectangular beds. Clipped fragrant rosemary hedges frame lemon trees, while a verdant wall of Parthenocissus resonates the vast wheat fields that go from vibrant green to gold as the seasons change. The 77-year-old German designer started her training when she was living in London. She also studied at the Inchbald School of Design, coincidentally 30 years before Whiting. She began designing gardens and writing about them before the two-year course finished. Appointed the garden columnist for German newspaper, Welt am Sonntag, she went on to write a weekly review for 15 years. Her own garden is her most personal work, a “laboratory” surrounded by oak tree groves. An unusually dense and leafy landscape for Mallorca, the mossy terraces are flanked by hedges of Buxus and Tucrium, and Cypresses are trimmed and shaped precisely to create geometric symmetries. Mulberry, Eleagnus, and Ebbingei create layers of green leading the eye through the surrounding oaks to the fields in the distance. The subtle framing and creation of vistas is not a happy accident, however. Much as a painter employs paint to draw your gaze, Menzel achieves the same effect in her gardens.